It’s a packed weekend of big jazz productions in the Twin Cities, and some of the choices are mutually exclusive. I’m eagerly anticipating the appearance of The Astral Project at the Artists Quarter, tonight and Saturday night, two sets per night (9/25-26). I recall very vaguely a performance some years ago, maybe at the old Dakota... maybe someone remembers where and when? 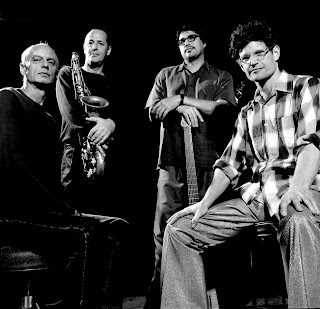 And frankly I had not heard the AP’s music in a long time, until I got a press kit from leader/saxman Tony Dagradi that included their 2008 release, Blue Streak. Dagradi had originally written the core suite of tunes under the title “Cobalt Blue,” in the aftermath of Hurricane Katrina. But in live performances, the AP added more music, and in the end, Blue Streak augments the suite with more material, both solemn and celebratory. Whatever the story, the music is as elegant, hip, modern, and appealing as any I’ve heard lately from 21st century jazz ensembles and particularly some of the most intriguing music I’ve heard from post Katrina New Orleans. Each member of the (now) keyboard-less Astral Project is independently acclaimed on his instrument—in addition to Dagradi, AP includes guitarist Steve Masakowski, bassist James Singleton, and drummer John Vidacovich. All have been part of the ensemble since its beginning 30 years ago except “newcomer” Masakowski, who has only been with AP for 20 years. This is as rare an event in the Twin Cities as astral projection. Competing this weekend: Saturday night (9/26) brings tough choices in mainstream and swing genres. 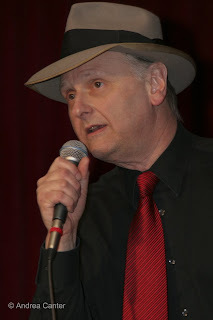 Arne Fogel, our town’s jazz vocal historian and ever-popular crooner, has assembled a new production in tribute to the centennial birthday of master singer/songwriter Johnny Mercer (“Have Mercer On Us!”) at the Bloomington Center for the Arts. Arne will share the stage with rising stars Nancy Harms and Sheridan Zuther, and special guest Connie Evingson, along with the Tanner Taylor Trio. Great voices, great songs. Great music and great tunes will also be highlighted when the JazzMN Big Band opens its new season at the Hopkins High School Performing Arts Center with guests Debbie Duncan and special guest star, Grammy-winning saxophonist Ernie Watts. Watts was here last year with Kurt Elling as part of Elling’s Coltrane/Hartman project. JazzMN Big Band is one of the top jazz big bands in the Midwest, offering charts from swing to bebop and beyond. Relax a bit on Sunday afternoon with yet another centennial tribute, this one honoring the great saxophonist Lester Young, as the kickoff concert for the Twin Cities Jazz Society’s Jazz From J to Z season. Led by the JAZZAX Saxophone Quartet (David Milne, Michael Walk, Pete Whitman and Greg Keel), the music of Young will also be highlighted by the Laura Caviani Trio (Laura with Gordy Johnson and Phil Hey) and special guests, local sax legend Dave Karr and sublime vocalist Charmin Michelle. This is a great opportunity to see the renovated Capri Theater in north Minneapolis. 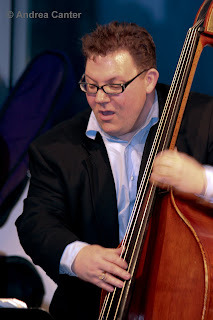 Another highlight later in the week, Adam Linz takes his new role as coordinator of jazz at the MacPhail Center for Music to the stage for the opening Jazz Thursdays concert of the season (10/1) in Antonello Hall. One of the most exciting and inventive musicians in the area (and that area is really global), Adam celebrates the release of his second solo recording (A Kiss for Luck) and then brings on his Fat Kid Wednesday cohorts Mike Lewis and JT Bates to finish the evening with edgy chamber jazz. Another acclaimed string-based trio, Framework, returns to the Artists Quarter on Wednesday (9/30), with leader/drummer Jay Epstein, guitarist Chris Olson and bassist Chris Bates. Speaking of edgy... always something to rock your ears at Café Maude on weekends, and this weekend it’s the Peter Schimke Collaboration. Not sure who is collaborating, but if Peter is in the middle of it, it will be worthwhile (9/25-26). There’s always more going on, far more than one can take in—Maud Hixson and Rick Carlson every Friday night at the Downtowner Woodfire Grill in St. Paul; Debbie Duncan (Galleria) and Aaron Keith Stewart (Mall of America) keep things swinging at both Crave venues tonight (9/25); California bassist Kristin Korb returns to the Applewood Grill (9/26); legendary New Orleans pianist Allen Toussaint (9/27) and the ever-evolving and always charming Christine Rosholt (9/28) at the Dakota; Charmin Michelle and Denny Malmberg swing at Fireside Pizza every Monday and Wednesday (9/28, 9/30); and KBEM’s next “REEL Jazz” film night at Bryant Lake Theater features Bob DeFlore’s “The Ladies Sing the Blues” with narrator Leigh Kamman exploring the great divas of jazz. Coming soon: The great bassist and fusion god Stanley Clarke has proven to be equally mythical on acoustic, and on October 4-5 at the Dakota, he makes this abundantly clear with a trio including young star Hiromi on keyboards and Return to Forever mate Lenny White on drums. Young trumpeter Adam Meckler releases his new recording at Dakota Late Night on October 2nd; the smart and sassy The Girls wrap up their long run with a farewell at the Hopkins Center for the Arts on October 3rd; the Northrop Jazz season launches with the Larry Ochs ensemble on October 8th; Basie Orchestra drummer Butch Miles begins a week residency in the area with the St. Croix Jazz Orchestra on 10/8 and back to back nights with the Wolverines in Bloomington on October 10-11; the AQ hosts a benefit for Dean Magraw on October 11th. There’s no excuse to say jazz is hard to find. What’s hard to find is time to enjoy it all. Good luck.